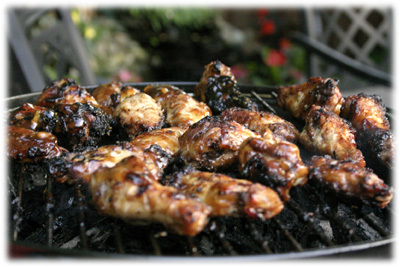 Grilled teriyaki chicken wings make a perfect addition to any casual backyard dining menu. Take it one step further and make it the whole afternoon or evening and just keep the wings coming, make a combo-platter and add some of the wings from this Honey-Hot Buffalo Wings recipe and this Honey-Garlic chicken wing recipe. You'll always have company at the grill when you're making these teriyaki wings, sometimes they don't even make it to the platter before their gone. Combine the ingredients for the marinade in a medium mixing bowl. 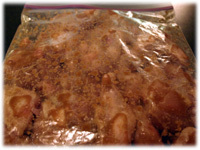 Add the wings to a resealable plastic bag and pour in the marinade. Refrigerate for at least 4 hours or up to overnight (better). 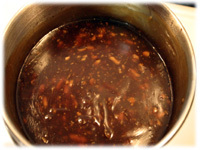 Combine the ingredients for the basting sauce/dipping sauce in a medium saucepan. Bring to a gentle boil stirring constantly and then reduce the heat to medium and simmer for 10 minutes. Add 1/4 cup hot water to a measuring cup and stir in 1 tablespoon of cornstarch until fully dissolved. Stir in the cornstarch mixture to the teriyaki sauce and keep stirring. This will thicken the sauce as you stir. If after a minute the sauce isn't as thick as you'd like repeat the cornstarch blend again with another tablespoon. Don't overdo the cornstarch - it takes time for it to take effect and thicken the sauce. If you've made it too thick then add some water to thin it out. Set the sauce aside and keep covered when done. 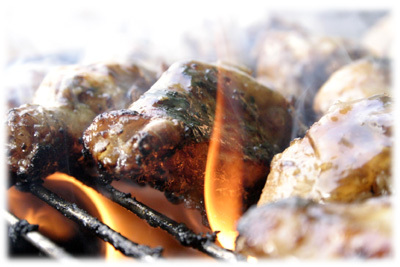 Setup the grill or barbecue for direct grilling, clean and oil the grates and preheat to 400F - 450F. Add the marinated teriyaki wings to the grill. Now would be a good time to get someone to go and get you another beer. 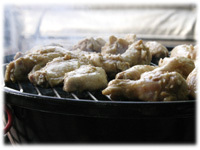 Every few minutes flip the wings over and move them around the grill to keep them grilling evenly on all sides. As they begin to develop nice char marks and brown up you can start to baste them with the teriyaki sauce. Pour a small amount of the sauce from the saucepan into a small bowl to use for basting. If you just baste from the saucepan you may contaminate the sauce and won't be able to use it for dipping. 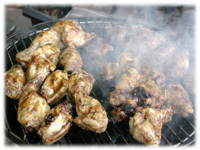 As you baste the wings keep flipping them and moving them around the grill to prevent burning. The sauce has high sugar content and will burn easily if you don't watch them. As they cook, remove them from the grill and serve with the reserved teriyaki dipping sauce.